_I dedicate this page to our beautiful mom Renata, a.k.a. Mamarda. They are all Nonni's recipes, and many more are still to come. Way back then, mom gave me the rights to post her recipes, and trust me when I say, they are the best. "A little bit of this, and a little bit of that" (quanto basta, meaning as much as you need). When I use to ask her: "So mom, is it ½ cup or ¼ cup?, she'd says: "Well you know, just a little bit." So I'll try to give specific measurements where I can, but otherwise you're on your own. Truthfully, you can't muck up anything as most of it is based on taste. Other great quotes received from Nadine: "A tavola non si invecchia”...one does not age at the table! 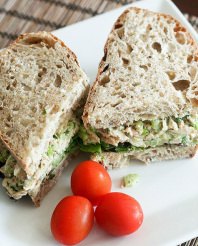 _This easy to make entrée can be spread on Italian or French baguette. It's easy to make and is excellent. PS. I'll try to do better with the picture next time. Cut slices in length (strips). Sauté slowly in oil, few slices at a time 'till golden turning them over once. Add more oil as required. Remove from pan and put on paper towel or brown bag. _When all done, remove excess oil from pan. Add tomatoes to pan breaking them up and add garlic. Simmer 10 min. Remove from burner and stir in fried eggplant. Salt and pepper to taste. Will keep in fridge for many days. Good at room temperature (when freshly made) or cold. Gateau – Pronounced "ga-tow"... hard "g"
Can be served as an entrée or a meal on its own. For us, it's a meal. Cook bacon to a crisp. Remove from pan and let cool. Keep fat. Cook spaghetti al dente. Drain (do not rinse) and put in large bowl. Add crumbled bacon, butter, eggs, salt, pepper, and cheese. Mix thoroughly. Return pan to burner on medium high. Add a bit of garlic salt. Pour spaghetti mixture in pan and spread evenly. Cook until bottom is crispy and golden brown (approx. 5 min. ); use a spatula to check the colour under. Turn heat down to medium low and cover. Cook an additional 10-12 min. Remove lid. Invert a large dinner plate over spaghetti. Turn pan over so that the gateau is in the plate, crispy side up. Add 2 tbsp. olive oil to pan. Raise heat to medium high and slide gateau back into pan to crisp second side. Cook 5 min. (or until golden brown), lower heat to medium low, and cover. Remove gateau from heat, slide into a large plate and let cool about 15 minutes. **Some like it with ketchup, while others like it with lemon pepper. Keep left over in fridge. Can be reheated in microwave, in a fry pan with butter, or eaten cold like pizza. Sauté onions in olive oil and butter until golden and soft. Add carrots and celery, and sauté until soft – do not brown. Add stewing beef and brown. You can remove most of the vegetables while browning beef. When done add the veggies back. Do not brown beef in separate pan – this will kill the taste. Add tomatoes and continue to sauté for a bit. Add chicken and beef broth, salt, pepper, and paprika to taste. Partially cook barley in separate pot to remove most of the starches. Drain and add to soup. 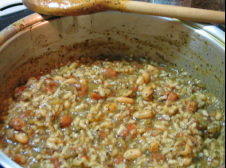 Boil soup on medium high until barley is cooked and soup has reduced to a desired thickness. You can use about one cup very cold water with about 4 teaspoons of completely dissolved cornstarch to thicken the soup further. Bring soup to a fast boil while doing this. Once barley is cooked, let soup simmer for an additional 30 minutes. Remove from heat and let it cool for about 15 minutes. Add red beans and parsley. Measurements depend on the quantity you want. Bring to a boil. Add a bit of juice from a can of tomatoes. Add 1 tbsp. butter. Simmer for 1 hour. Add more water if needed, salt, pepper, 1/4 cup white wine. Add small pastina or orzo. If too thick, add more broth. Serve and sprinkle with fresh Parmesan cheese. _Not the true picture. Will add when available. Hubby makes this. Is the kiddo's favourite. Add oil and butter in pot. Sauté ground pork, carrots, celery, and onion. Add can of lentil, chicken broth, and spices. Simmer 1/2 hour. Sauté all vegetables in oil and butter until onions are soft. Add tomatoes and stir. Simmer for a while then add enough water for the desired quantity of soup. Add chicken cubes, wine, and a pinch of sugar. Mix flour mixture and add to soup to thicken. Cook slowly until vegetables are tender. Add beans and keep simmering. In the end, add a small quantity of small pasta. Cook until pasta is done. This soup recipe gets better every time you make it as you discover new spices you like and add. When I make it, I double the recipe. That's how crazy good it it. The most important part is to get the base right. In other words, get your spices in from the start. Seasoning afterwards will not cut it. Sauté above ingredients in pot with 1/4" oil – yes, lots of it, and simmer until celery is soft (30 min. or more). Simmer slightly, then add 1 cup al dente rice when you are near serving. The rice should be precooked and drained (if excess water). Cover, simmer slightly to warm everything, and server with nice crusty bread. Let cool and enjoy with lots of fresh grated Parmesan cheese and fresh bread. _Tip: if you find it too thick, you can add a bit more water or chicken stock – 1/2 cup at a time. A twist: I made it lately and added a chopped onion with the first mixture. Gives it a nice flavour. Experiment... it's all about the flavours you like. Recently, I tried Romano beans and it was also excellent. Next time, I will try red kidney beans. This soup gets better the next day after all flavours have come together. When reheating, you'll most likely need to add a bit of water (or chicken stock) as it will be thick. _Always mix your sauce with the pasta, do not just plop it on. All of the pasta should be wet. Last but not least, serve it with lots of fresh grated Parmesan cheese. And don't forget... never, never rinse your pasta. Sauté steak in oil and butter. Add spices – do not brown/burn garlic. Simmer until meat is tender. Cut meat into strips, break egg over meat and let white run off. Cover pan to cook egg, and add salt and pepper. Sauté all but chick peas in a bit of oil 'till garlic starts to smell (good that is, but do not burn). Add the chick peas, salt and pepper. Simmer 2-3 min. Serve with rigatoni and fresh cheese (Romano or Pecorino). _My favourite and so easy to make. It requires cured Italian bacon called pancetta – find an Italian grocer. Being cured, it is also delicious as a sandwich (on an Italian bun of course). Have it sliced very thin. This recipe cannot use bacon as a substitute. Fry over medium heat for a few minutes or until onions are transparent. 1 dry chili (in jar) – remove when sauce is a bit hot. Simmer 1 hours then mix together with rotini, rigatoni, penne, or similar pasta. While this is my real picture, it is not of this recipe but is very close. Will post a new one once I have it. Fry sausage, red pepper, and onion gently. Add remainder of ingredients and simmer for a while. When done, put pasta in large bowl, add Parmesan, and then the sauce... which makes the sauce stick to the pasta. Serve and add more Parmesan to taste. _Not the real picture. Will post when I have one. 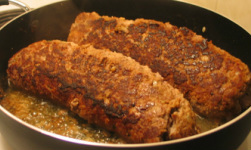 Pound meat slightly, flour on both sides, and sauté in oil and butter. Remove from pan and set aside. Mix and simmer about 1 1/2 to 2 hours. Keep adding some water when liquid evaporates. Can be served with pasta or on its own. Variations can be made... with or without anchovies, and herbs to your liking. Add a bit of oil in fry pan, add tuna and anchovies. Sauté lightly. Add parsley and garlic and continue to sauté for 2 min. Add remaining ingredients and simmer ½ hour or until thicken. Cook pasta and when done, pour directly in the sauce. 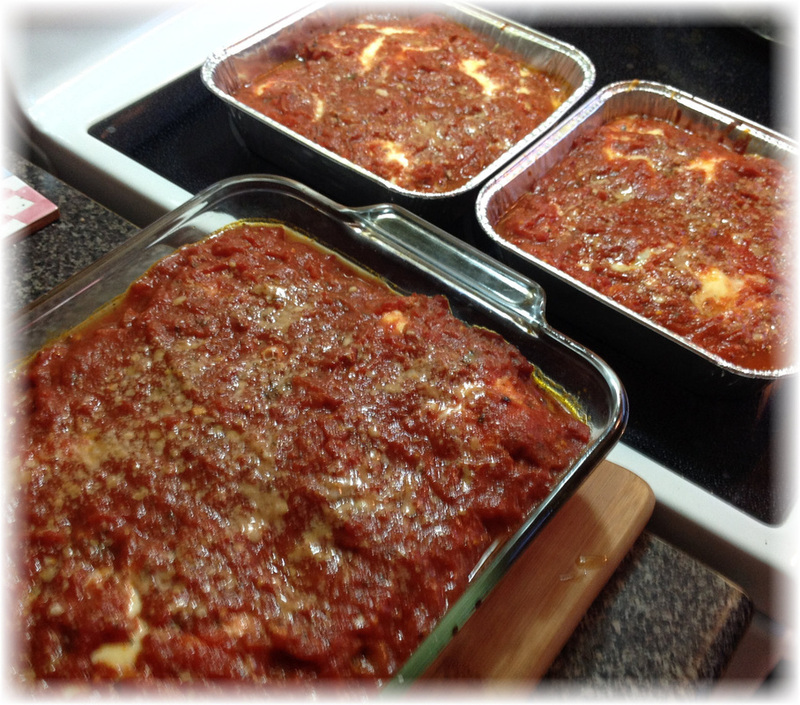 Mix and serve with lots of fresh Parmigiana. Serve with linguine or the like. In these pictures, penne was used. Pound steak lightly. Spread slices of pancetta, sprinkle Parmesan cheese, parsley, garlic, salt and pepper. Roll up and secure with toothpicks. Add a bit of oil and butter to fry pan. Sauté rolls until golden. Let water evaporate. Remove and put in plate. Serve with spaghetti, linguine, or similar pasta. Spices are really to your liking. Will have to make again. Add onion in pan and sauté until tender. Add rest of ingredients and simmer covered 1 hour. _Not the real picture. Will post it when I have it. Simmer first 3 ingredients in a bit of oil until celery is tender. Add tomatoes, salt and pepper and simmer 10 min. Add can of white kidney beans and simmer 2-3 min. Serve with Italian rice or orrechietti pasta. Add oil and butter in pot. Sauté onion until transparent. Add meat, garlic, and parsley. Raise heat and sauté until water is boiled off and meat starts to brown. Add tomato paste, mashed tomatoes, chicken broth, and wine. Simmer slowly. Add a bit of water if too thick. To thicken, add flour and water mixture. Cook until meat is tender – about 2 hours. While assembling the ingredients was easy, frying it was not. The next time, I will either cut the recipe by half or make three smaller loaves. They were really hard to turn (brown) in the pan because they were soft. End result, however, was excellent! Form hamburger mix into 2 small balls, and then flatten each one into a rectangle. Cover each rectangle with the filling and roll up. **You might find it easier to roll it if you put the meat on saran wrap – will help to roll up. Fry loaves in a bit of butter and olive oil. Brown on all sides – it's tricky to turn them over as they will tend to break apart. Use two spatulas or the like. Carefully remove rolls from pan and drain most of the fat (but not really required). Return rolls to pan and cook at least one hour covered (put the lid at a bit of an angle to let the steam out. Add more liquid – water or broth if it boils down to much). Let cool and slice in 1/2" slices. Excellent as a sandwich the next day. I recently made it again and had better success with the handling of it because I made them smaller. With half of the meat, I also made muffin meatloaves, which were also excellent. Here are some pics and of the muffins as well. I will definitely make it like this again, including the muffins. NOTE: Muffin meatloaves take less time to cook. Just watch until they get nicely browned. Dredge meat in flour. Sauté in oil and butter until brown. Remove from pan. In same fry pan, add onion and red pepper. Cook until onion is transparent. Return meat to pan. Add tomatoes and tomato paste. Break up tomatoes. Bring to a slight boil, add wine, chicken broth, and spices. Simmer 1 1/2 to 2 hours on stove top. Add water if too thick. Obviously made with boneless pork. Dry meat with paper towel. Pound if thick. Apply a coat of Dijon mustard. Coat pork evenly with a flour and salt mixture. Dip in combined 2 eggs and 2 tbsp. of water. Dip and coat in combined breadcrumbs, Parmesan, and a bit of lemon rind. Fry slowly in hot skillet with a bit of butter and oil – approx. 3 min. per side. Many variations can be had with risotto. You can add fried mushrooms, fried bacon, diced celery, shrimps, etc. Whatever you feel like having. Explore and enjoy. I always have hubby make a large batch so that I may make suppli al telefono with the rest. Make the broth and keep warm on low heat. Heat 4 tbsp. of butter in a large pot. Add the rice and stir until well coated with the butter. Add the sauce and stir over med. heat until rice is all coated. Add 1/2 cup of hot broth and stir until rice is absorbed. Continue adding 1 ladles of hot broth at a time and stir continuously for about 20-25 minutes or until the rice is cooked, but remains firm – al dente. 8. Remove pot from heat, add the remaining 2 tbsp. butter, mushrooms, and the Parmesan cheese. Let cool slightly and serve with additional cheese. Add the white wine, and stir over med. heat until it is absorbed. Rub lots of Dijon mustard on pork roast, pepper, and salt. Put in pot then add cut potatoes, carrots, mushrooms, chicken broth, and white wine. Liquid should cover 1/3 of the potatoes. Add bay leaf and rosemary. Cook at 500F for 7-10 minutes, then at 350F. *Well done is 35-40 min. per lbs. Sauté pork roast slowly until golden brown. Add mushrooms and onion chunks. Add chicken broth and white wine. Cooking time is much like the oven method or longer. If sugo (sauce) is too thin, add a small mixture of flour and water (1/4 to 1/2 cup). Add oil and butter to pan and slowly fry sausages until golden. Add potatoes, onions, garlic, parsley, and red pepper. Stir and cook a few minutes. Bring to a slight boil, then add tomatoes, chicken broth, and wine. _These rolls are my favourite. I always have hubby make them for me since he does them best. They are easy to make and make for a beautiful presentation. They are best served with tondinis... if you can make them. We normally serve them with fresh homemade small ravioli. You'll find those at your Italian grocer's "Fresh Pasta" section. Trim fat (if any) and pound meat. Put slices of prosciutto or salami on meat. Put thin layer of scrambled eggs, sprinkle parsley, cheese, salt and pepper to taste. Roll up and secure with string at both ends and middle. Fry rolls in pan with oil and butter. Start on high burner to sear meat then put on low. Cook slowly and continue turning until golden (15-20 min.). Remove from pan and set aside. Add onions to pan and when translucent, add mushrooms. Brown for a few minutes. Put meat back in pan, add carrots, and then add enough chicken broth to almost cover meat, ½ cup or more of white (or red) wine, enough to almost cover meat, salt and pepper to taste. Simmer about 40 min. and once in a while, turn meat so the exposed part does not dry out. Add a bit of water or broth as it evaporates. Remove meat from pot and cool 30 min. before serving. Cut meat in very thin slices. To a cup of very cold water, still vigorously about 2 tbsp flour until completely dissolved. Bring pan sauce to a boil. Mix the flour mixture a bit at a time and stir until thicken (1 min.). Turn heat off, and stir occasionally – as it cools, it will further thicken on its own. For a nice presentation, place sliced meat in a ring on a large plate. Put fresh cooked ravioli (or the like) in middle. Spoon sauce (including mushrooms and carrots) all over. We normally have this meal on Christmas eve. Combine butter, Dijon, and pepper. Rub all over veal. Sauté slowly in oil and butter until golden. When done, put on platter and set aside. Fry veggies in meat oil slowly until onion is transparent. Add the chicken broth slowly, the wine, salt, pepper, and garlic. Add veal to pot and enough water to cover 1/2 the veal. 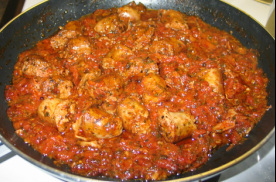 Simmer until cooked – about 30 min. per lbs. Remove the meat and let cool. Bring meat sauce to a simmer. Add a mixture of flour and water to thicken. To serve, slice meat and put in large plate. Pour sauce and veggies over meat. **Can also be served with fresh ravioli. Use same sauce for ravioli and lot of fresh Parmesan cheese. Dredge chops in flour, beaten eggs, and bread crumbs (in this order). Fry slowly in oil and butter – about 8 minutes per side. Serve with cauliflower salad. Can add capers and white beans. Brown veal roast slowly in oil and butter until golden. Add chicken broth and white wine. Not too much for this sugo. Cook until done. Remove from pot and set aside. In small pot, add small amount of oil, butter, garlic, 2-3 anchovies crushed, a few tsp. capers, chunks of tuna from a can, chopped parsley, 1-2 oz. white wine. Cook until it all comes together. 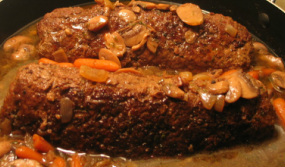 Cut thin slices of roast and place in dish. Spread sugo over meat. Meat can be room temperature. There's nothing more comforting than chicken parmigiana. I try to make it as often as I can. This time around, I decide to adventure and try a batch of muffin parm. All I can say is that I will definitely make it again. 6 pieces chicken breasts – breaded in flour, eggs with salt, and breadcrumbs (in this order). Fry in oil on medium-low until golden brown. Set aside. Put a bit of oil and butter in fry pan. When bubbling, add tomatoes (breaking them up), wine, salt and pepper. Simmer 1½ hour. If sauce becomes too thick, add broth or water. I never need to add anything. Yes, I know, I always go overboard!!! But when it's good, it's good!!! Arrange fried chicken in long pan. Top with slices of mozzarella (Italian). Sprinkle grated Parmesan cheese (fresh). Bake @ 375F until it bubbles (approx. 30-40 minutes). Just made it this past weekend (April 2014) and it was delicious. As usual, I always make more, but hey, we had leftovers for two days after. A single recipe serves 4. **I used 3 peppers... red, yellow, orange. Two onions, 2 fresh tomatoes, and 8 potatoes... all due to the amount of chicken I had, which was 4 pieces and 5 drumsticks. Put oil in roasting pan. Add onion and red pepper at bottom. Brush chicken and potatoes in oil. Put chicken in one corner of pan and potatoes in other. Break tomatoes on top. Add salt and pepper, paprika, rosemary, and 4-5 basil leaves (I used dried). Bake @ 375F for 1½ hour. 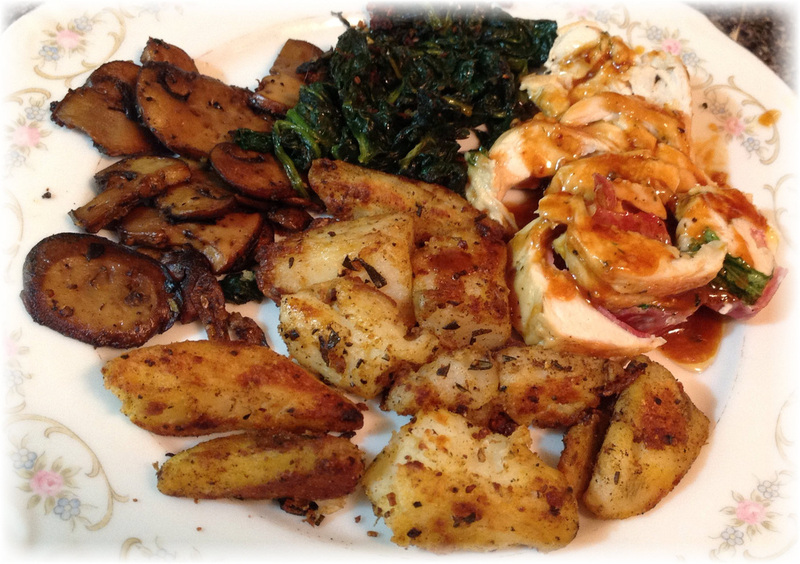 Made with roasted potatoes and spinach (also on this page) and fried mushrooms. Most excellent. Will definitely make again. Slowly sauté fillet in a bit of oil and butter until golden. Add wine and broth (about 1/2 cup of each). If it evaporates too fast, add a bit more. Slice lengthwise if too thick. Spread prosciutto, cheese, salt, pepper, and parsley. I also added fresh basil leaves. No regrets. When done, let cool for a few moments, slice and serve. Here, I made roasted potatoes, spinach, and fried mushrooms. Top with the pan sauce. Amounts will vary according to size of turkey. Break stale bread (crumb only, not the crust) to dry out. Pieces should be about the size of your thumb (no bigger). We normally put it in a large bowl, covered with a diner plate for the night. Toss once in a while to dry the crumbs out. Sauté onions on low heat in oil and butter. Add mushrooms, heart and liver, garlic, and parsley. Cook until onions are transparent. Mix onion mixture into breadcrumb bowl. Add Parmesan cheese, salt and pepper to taste. Add eggs to bread mixture and fluff with a fork gently. Wash turkey cavity in cold water and dry out really well. Put salt and pepper inside. Stuff inside and under the skin. Balls can be made with leftover stuffing. Bake at 350F – 30 minutes per lb. Cover lightly with a foil. Baste occasionally with melted butter; a bit of red wine can be added to the butter. In the last hour, remove foil and continue basting every 10 minutes with the juice the bird releases. If bird releases juice sooner, use it instead of melted butter. Let stand 20 minutes before carving. Directly from the bird pan, put on high burner. Skim fat from pan if any. Add 1/2 to 1 cup red wine and boil to evaporate. To thicken, add a mixture of flour and water (1/2 c. cold water and 3 tsp. flour mixed until it looks like milk). While pan juice is boiling, add flour mixture, stirring constantly until it thickens (10-20 seconds). Remove from heat immediately. Serve over turkey. 2012 Stuffed Turkey – If you make it, they will come! Here, the ingredients are to taste. Chop a can of tuna in a bowl. Add Dijon mustard (about ½ tsp. ), about 1 tbsp. butter (or margarine), capers to taste, a chopped hard-boiled egg, salt and pepper. Spread on bread of your choice. _This excellent fish dish is nice with haddock and easy to make. Flour fish and sauté lightly in oil until golden. Remove and put on paper towel. Add remaining ingredients to fry pan (breaking up tomatoes). Simmer 10 min. Add fish on top of sauce and continue to simmer 10 min. Nice on its own or served over rice. _This dish can be serve cold and is very nice as an entrée. Put about 2" of water in fry pan. Add fillet and 2 drops of vinegar. Fish is done when water boils. Remove and put on serving dish. Remove excess water from plate. Spread remaining ingredient except lemon, salt and pepper over fish. When ready to serve, squeeze lemon, salt and pepper. Mix ingredients and spread on fish. Roll up and secure. Put in pan with oil at bottom. Bake @ 375F – 20 min. Fish will go watery. Remove excess water. The secret here is to put and mix the ingredients directly on the salad and then mix with your hands. It should also be prepared at the last minute since the lettuce will wilt. Wash and pat dry one head boston lettuce. Add following ingredients and mix with hands as you go. Yes, I know, you'll say: "Who doesn't know how to make a cauliflower salad? ", but trust me, this one is truly awesome. Give it a try, it's really easy and delicious! Carve cauliflower stem out. Drop whole cauliflower in cold water (¾ covered). Cook until just done (about 15 min). Pierce to check – should still be crunchy. Rinse in cold water and break up in pieces. Put in bowl, add remaining ingredients and toss. Slice ripe and firm tomatoes 1/2" thick. When done, put in plate. Add capers, basil, salt, and pepper. This is a meal on its own. The salad is washed whole and carefully to prevent crunching into sand/soil, then prepared with olive oil, black olives, anchovies, garlic, and then cooked in a pot. Yes it will be wilted, but that's how it's made. It's quite yummy and filling. Served over a big slice of French bread. Wash salad carefully. Rinse it a number of times to remove all soil from the bottom. You might want to fill your sink with cold water and put the salads in to release the soil. Drain to release as much water as possible. Put salads in a pot/container to hold them upright so that you may stuff them. Drizzle about one or two ounces over top the salads to coat well in and out. Stuff leaves with black olives, anchovies, and garlic. Snugly tie the salad tops with kitchen string to keep the filling from falling out when cooking. Put salads in a pot large enough to accommodate them snugly when laying them down – not too large, not too small. Add about 1/4" water in the bottom of the pot. Cover and cook over med. heat for about 15-20 min. – or until they shrink and wilt. By then, there will be about 1-1 1/2" juice in bottom of pot. Serve over a thick/crusty slice of bread. French bread works really. Don't forget to remove the strings. Pour juice over salads and enjoy. Like chicken parmigiana but with eggplant. Peel and slice eggplant 1/4" thick. In colander, put rows of eggplant and salt. Put pressure over and let stand one hour. This will take the bitterness out. Rinse in cold water and pat dry. Coat slices with flour and egg. Fry in oil and place on paper towel or brown bag to remove excess oil. Pat oil out twice. Put a bit of oil and butter in fry pan. When bubbling, add tomatoes (breaking them up), wine, salt and pepper. Simmer 1½ hour. If sauce becomes too thick, add broth or water. 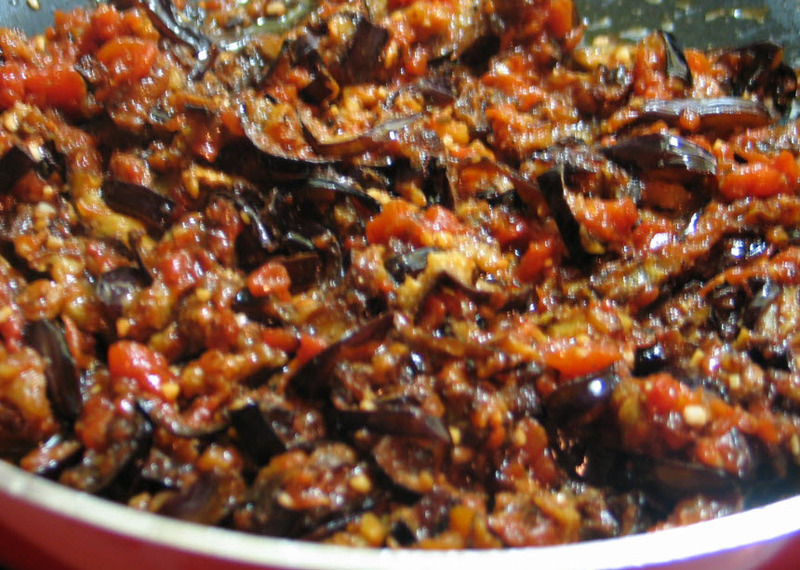 Place eggplant in long baking dish. Top with slices of fresh mozzarella, sprinkle fresh grated Parmesan cheese and cover with sauce. Cook @ 375F until it bubbles (approx. 30-40 min.). Cook pearl onions in water for a few minutes. Drain and set aside. Put oil and butter in fry pan. Squeeze juice from 2 oranges in pan, add salt and pepper. Boil, then add onions. Let sauce evaporate. Keep mixing to coat all onions. Add 3 tbsp. brown sugar and mix to coat. Add butter to rice and mix. Put rice in small dish (ramekin like). When serving, turn cup over (will retain the shape of the ramekin dish). Sprinkle Parmesan cheese over rice. Put a bit of butter and oil in bottom of casserole – pie plate (not much). Add thin slices of potatoes. Do not overlap. Sprinkle with bits of broken up tomatoes – canned. Layer thin slices of onion rings, add grated cheddar cheese, and freshly grated Parmesan. Repeat layers about 3 times, finishing with the cheese. Add salt and pepper and dot with butter. Bake at 375 for about 1 hour – potatoes should be soft. Peel potatoes – cut into wedges. Boil until not completely cooked, and drain. Heat oil and butter in fry pan, add potatoes, salt, pepper, and rosemary. Stir and fry until golden. Put in bowl with paper towel to absorb oil. Boil potatoes for about 10 minutes and drain. Let cool for a few moments. Heat oil and butter, add taters, and spices. Fry a few min. and turn over. If crispier, continue cooking and turning to your liking. Wash spinach and put in cold water – 2" in the pot. Boil about 2 min. Add a bit of oil and butter in a fry pan. When hot, add spinach and some grated Parmesan, salt, and pepper. Add beaten eggs, salt, oil and mix. Add flour. Mix until dough is soft. Slice dough in small pieces. Roll to form cigar-like shapes then form small doughnuts. Press ends to close loop. Flour them to prevent from drying. Fry in oil until golden. Spread in a bowl separated with paper towel. Serve with meal, and smother with sugo (sauce). Ouffff, another recipe I have not made since about 1992. Definitely must do again soon and display some pictures. First time making was a total success... the filling that is. Don't think I would attempt the dough. Store bought are delicious provided they are fresh. Go to your Italian grocer and get some. Boil 2-3" water in pot. Put another pot on top to form a bain-marie (double boiler) over. In the bain-marie, whisk the eggs, sugar, and flour hard continuously until no lumps are left. Add the milk and stir until no lumps. Add the lemon and mix. When thick, remove from heat and remove lemon. Put in bowl and let cool. Cover with saran wrap and refrigerate. Bring milk to a boil. Add butter, sugar, raisins, and salt. Lower heat and boil softly. Gradually add cream of wheat. If too liquid, add more. Should be medium soft. Add lemon or orange peel and rum. Pour in round bowl and let cool. Invert and slice in wedges. _Mom's Christmas cookies – my favourites. Make cookie dough in large bowl. Combine flour, butter, almond, sugar, salt and extracts. with hands, mix until thoroughly blended. Refrigerate covered 1 hours. Meanwhile, make vanilla sugar in blender. Combine vanilla bean and 1/4 cup sugar. Blend on high speed covered, about 8 seconds. Combine with remaining sugar on a large sheet of foil. With palm of hands, roll each ball into a 3" long roll. Place rolls 2" apart on ungreased cookie sheet. Curve each to make crescent shape. Bake 10 to 12 minutes or until set but not brown. Let stand one minute. With spatula, place hot cookies in vanilla sugar; turn gently to coat both sides. Cool. Before serving, coat with additional vanilla sugar.